The sun is up, Pride is on the horizon. Way back in December last year Songbirds were invited to perform at a wedding – the third matrimonial event we were to perform at as a choir. What it is to be in demand! Respice, Prospice: Here come the japes of January! As we nestle in these last few peaceful moments before we thrust ourselves back into our usual routines and take on the bluster of January, I find myself reflecting on the many activities of the last month. This Christmas it was our pleasure to make a return visit to the Lesbian and Gay Christian Movement’s (LGCM) Christmas Carol Service. It provided a lovely opportunity for us to share the stage with the boys at SWGMC and to support the good people of City United Reformed Church and The Gathering. City URC have been fantastic in supporting us on our journey thus far and we continue to be deeply grateful for the use of their beautiful church as the base for our weekly rehearsals. The service was lively yet thought provoking with a number of deft changes of pace between the celebratory boom of carols like the ’12 Days of Christmas’ and quieter reflections from guest speakers on what it means to truly stop and observe Christmas. Particularly poignant were the speeches made by representatives of Displaced People in Action (DPIA), a charity which works with refugees and asylum seekers and who are looking to set up a coffee morning for LGBT* refugees and asylum seekers who may be struggling to find community for many reasons. On the 14th of December we played host to our own Christmas Concert ‘Sing Noel! With Songbirds Choir’. In spite of the enthusiastic attempts of this year’s triumphant cold virus to flatten our forces, we pulled through as a choir and managed to deliver a buoyant and joyful performance at Jolyons. It was fantastic to sing to a full room and I get the distinct impression that the audience enjoyed it as much as we did! There’s something about a pinch of adversity that brings this flock together and I think the light and strength of our bonds as a community (which doesn’t take itself too seriously…) shone through. On the 19th we popped up to the second floor of John Lewis on the Hayes to entertain the milling masses with our own brand of festive fun. It was something of a departure from the focused beam of audience attention that we have experienced at our previous gigs as our listeners made their way around the shop to our dulcet chorus, but it was evident from the smiles (and from our own sofa-based family of impromptu supporters) that we were able to add something special to the atmosphere. At the end of the month we paid a visit to De Courcey’s Manor to sing at our second wedding gig of the year. This was great fun despite the many and varied logistical challenges of getting ourselves back to Cardiff for the 27th. (Thank you to our pianist Rich for rescuing our Musical Director from Newport…). And yes, the bride looked beautiful. In a way the season saw us come full circle – returning to Jolyons and ending the year by fulfilling the gig we booked in June (or maybe May?) after we were spotted singing at the wedding reception for two of our own ‘Birds. By my watch that makes it the perfect moment to heed the words of my beloved late mentor MG – ‘Respice Prospice’ (Look back, but also look forwards). And so we launch into 2016 buoyed by the successes of the last year and lifted by the hope of all that is still to come for our community. Our first stop – finding some more of us! To this end – on Wednesday the 6th of January we will be holding a New Members session, and you are very welcome to join us. 7.30pm at City United Reformed Church on Windsor Place, Cardiff. No auditions. Just community and choir fun. 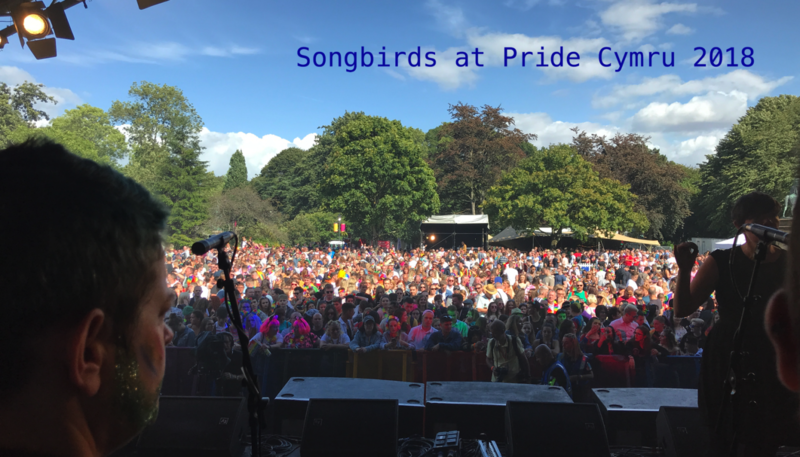 Songbirds Choir is a Cardiff-based non-auditioning community choir for self-defining Lesbian, Bisexual, and Trans* women. I have a lot of contradictory feelings about Pride. The left-leaning corner of my brain can’t help but be cynical as supermarkets and highstreet banks lift a rainbow banner with one hand and place a neat tick in their ‘community conscience’ box with the other. I see members of the public string a boa around their necks, but curl their lips at my tattoos and buzzcut, and I think – what exactly does queer visibility mean here? But I remember being 18 years old and stepping onto the platform of Brighton station for my very first Pride parade. I had never seen so many LGBT* people in one place, I had never seen such a colourful expression of identity and difference, and I had certainly never seen support for that expression on anywhere near as large a scale. As an event, Pride is politically complicated, but the fact remains that it is the one time of year when we can see some reflection of ourselves on every street corner. And it is an opportunity to show ourselves, like a message in a bottle to the young people who follow us, and a salute to those who went before; it is our chance to demonstrate our presence, to hold up all the variations and permutations of LGBT* identity, and to show that they are all so very possible. As a community choir, we are a mixed bag – in age, in lifestyle, in gender identity and presentation, some of us with disabilities, and some of us with families. So when we stand together, we are a bold handful of possibilities; and singing, we can open ears and minds to the complex beauty in the harmony of individual voices. As August gives way to September and the rush of summer abates, we will go back into regular rehearsals, drawn together by our common love of music, our stories, and our laughter. We will look back with pride on the music we created together, but more importantly on having built a space which embraces many hues and refractions. And we will hope to add to it. Songbirds Choir meets at 7.30 every Wednesday at City United Reform Church, Windsor Place, Cardiff.